As the subtitle of Neil Bissoondath's book says, multiculturalism is a "cult" in Canada, not a typical cult in which a small group of very devoted supporters worship something or someone, but a cult officially endorsed by the elites across the nation, seemingly accepted by the majority, inscribed in the legal system, the media, schools, textbooks, historical narratives, and endorsed by all the political parties. Published in 1994, this became one of the most controversial books in 1990s Canada; in the revised edition published in 2002, Bissoondath recounts the "roller-coaster ride" he experienced upon publication, the many reviews, promotion circuit across the country, rounds of media interviews and talks at universities and community colleges, phone-in shows on local television, and addresses to "audiences in one packed hall after another". But he soon noticed that the "unduly critical" responses were coming not from the general public, but the established media, political parties, and university professors. The many Canadians he encountered in his talks were either sympathetic or quite willing to discuss the arguments of the book. The "cult" of multiculturalism has been, indeed, a state-sanctioned ideology imposed from above without democratic consent. Bissoondath refers to a survey conducted in 1993 in which about 72 percent of the respondents stated that Canadian multiculturalism was not working and should be replaced by the cultural melting pot policy of the United States. 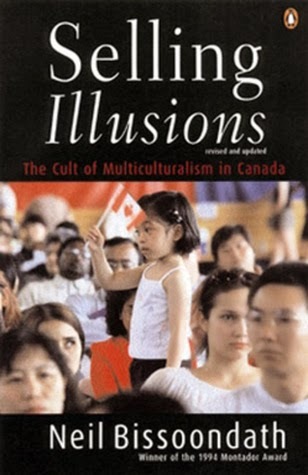 The argument of Selling Illusions is in line with the feelings of these respondents: multiculturalism encourages immigrants to hold on to the habits, values, and ethnic identities of their former homelands rather than assimilate into the culture of Canada. My position is closer to the multicultic view of the elites — but for diametrically opposite reasons. The general public senses that something is amiss in Canada but misses the target in believing that the problem is multiculturalism. The problem is not multiculturalism as such; it is the policy of mass immigration from non-European cultures. Will Kymlicka, and other communitarians such as Charles Taylor, are right: individual fulfillment is not something that can be achieve in isolation but only as a member of a community; a constituent component of a community is the cultural and ethnic identity of the members belonging to it. One of the key goals of multiculturalism is for "mainstream" Canadians to acknowledge the attachment of minorities to their respective ancestral communities; hundreds of thousands of immigrants arriving from non-European lands every year cannot be expected to brush aside their customs and ethnic identities; they must be given recognition; to demand that immigrants relinquish their beliefs and traditions for the "mainstream values" of Canadians is a form of cultural supremacism, for it amounts to the belief that the "Western ways" of the majority of Canadians are better than the ways of immigrants. The policy of multiculturalism, of course, does not call upon immigrants to create a new political order with illiberal institutions but expects them to accept freedom of speech, representative government, and cultural pluralism, that is, tolerance of the day-to-day habits, languages, foods, music, dressing styles, and many other aspects that make up the day-to-day lives of different ethnic groups. Multiculturalism encourages immigrants and mainstream Canadians, everyone, to accept a multiethnic and a multicultural life-world (if I may use the language of sociological theory), at the same time that everyone agrees that liberalism offers the best political framework for the existence of this life-world of coexisting and interacting lifestyles, rather than a common or uniform (Eurocentric) life-world. with the mass entry of Mexicans, there is little melting going on in many areas of the United States. While the United States does not have an official policy of multiculturalism at the federal level, one finds, under the pressure of relentless immigration and political correctness, a multiplicity of pro-diversity policies and programs at the state and municipal levels on matters related to school curricula, policing, hiring practices, and race relations generally. This is not because there is something wrong with Mexicans; they are all too human. Simply, Mexicans are very different from European Americans; they have a strong attachment to their ethnic identity, pride in their history, and Spanish language; they don't want to sit in classrooms and hear about how the Americans modernized the former Aztlan territories, or how many inventions White Americans were responsible for as compared to Mexicans. Multiculturalists are correct in realizing that there is a form of cultural supremacism in the expectation that they should obediently assimilate to the history, habits, and folkways of Europeans. These words come from The Disuniting of America: Reflections on a Multicultural Society (1998), in which the author shows that America is just as multicultural as Canada (despite the endless pageants among Canadian assimilationists about its melting pot culture). What Schlesinger failed to understand is that the blame he otherwise attributed to the spread of political correctness, with its promotion of bilingual education, Afrocentrism, and minority pride in schools, was developed not in a vacuum but in direct response to the new racial realities of the United States brought on by immigration. Non-Europeans in America were both growing in numbers and in awareness of their identity, and they did not want to join a so-called "common American identity" which came from European Whites. Minority histories were first introduced in the curriculum in recognition of the fact that, to this day, Blacks and Indians have not assimilated well to the culture created by the majority European peoples of America. Therefore I recognize the inescapable multicultural reality of a culture with diverse ethnicities and open borders. Assimilation is the illusion. Given this racial reality, we Europeans need to make use of the levers of multiculturalism for the protection and enhancement of our ethnic and cultural heritage. To demand assimilation is suicidal since a "common" culture based on the fusion of multiple ethnicities coupled with our current open borders is not really a culture that can be identified with the historical reality that Canada was created by Europeans. His book was popular in large measure because he was an immigrant from Trinidad calling upon other immigrants to let go of their ethnic ancestries, not play multicultural politics, but join the "common Canadian culture". Nevertheless, in the end, the Canada Bissoondath envisions and cherishes is not of immigrants assimilating to the Canada created by Europeans, but of immigrants joining him in celebrating the making of a radically new Canada characterized by a fusion of cultures, a potpourri of mixed ethnicities constructed out of the "free" choices of deracinated individuals. Bissoondath's childhood memories of Trinidad are both boring and few; before coming to Canada he was already seeking to escape the "confines" of his heritage; and when he visited Trinidad a mere year after departing, he was "impatient to get back to Toronto". This utter lack of attachment to his homeland is unusual, but perhaps understandable in light of the culture of violence and racial tensions in Trinidad. He takes it as proof that everyone can and should escape from the confining atmosphere of their heritage. He arrived in Toronto in 1973, and was immediately drawn to its diversity and the multiple choices it afforded individuals. While about 95 percent of the Canadian population was ethnically European in 1973, non-Europeans had started arriving in larger numbers in the 1960s, so that, by 1970, half of all immigrants were coming from Caribbean nations, Asia and South America. It was this reality that Bissoondath encountered in Toronto where many of these immigrants were taking residence, not to mention the diversity among European themselves. From his arrival until the writing of his book in 1994, or the publication of the revised edition in 2001, the number of immigrants from non-European lands kept increasing. From 1981 to 2001, the number of visible minorities — excluding Aboriginals — increased more than threefold from 1.1 million people, or nearly 5% of the population, to 4.0 million people, or 13% of the population. This rapidly changing ethnic reality is what Bissoondath identifies with Canada. He is calling for assimilation to this newly emerging and ever more racially and culturally mixed Canada. He is not calling for assimilation to European Canada. Hating Eurocanadians who Affirm their Ethnic Identity? Bissoondath is just as critical of European Canadians attached to their heritage in Canada as he is of immigrants attached to the recognition multiculturalism affords them. Actually, he is more critical, designating as "racist" members of the "political right" who oppose our current immigration levels. He is right on target about the way the left brands as racist "anyone critical of multiculturalism policy", and the way minorities manipulate multiculturalism both as victims in need of special treatment and as proud members of their ethnic groups, while accusing Europeans of being racist if they show pride in their own heritage. Bissoondath would like all individuals to stop thinking in terms of their collective identities and view their identities as social constructs shaped by the free play of their own choices in a changing environment. But why does he presume that allowance for individual choice in the making of one's identity somehow precludes individual attachment to a collective sense of one's identity? He knows that the charge of racism has "particularly virulent" consequences in Canada, and yet he says that to define oneself by one's ethnicity or race is racist.3 Are all Canadians then obligated to feel the way Bissoondath feels about his identity? This is what has happened to European Canadians; they are the only ethnic groups disallowed from showing any pride and attachment to their heritage — despite, or, I should say, because of the way multiculturalism has been understood as a call only to minorities to protect and enhance their ethnic identity. Anyone who endorses the radical transformation of Canada's culture from an overwhelmingly European nation into a thoroughly immigrant and ethnically mixed culture is a cultural Marxist. He says that multiculturalism "is in many ways a statement of activism" directing the government to play a role in shaping the cultural evolution of Canada.4 But the real force of activism is mass immigration from the non-European lands. Multiculturalism in a Canada that was still 96% percent European in 1971 would have amounted to the reinforcement of Canada's already existing identity. By contrast, advocating assimilation in the context of mass immigration from non-European lands is a form of activism that is radically transforming the nation forever at a pace never witnessed in human history. Sorry Bissondath: Canada was a White Christian Country! the French-speaking population numbered about 70,000 in the 1760s, and thereafter, until the 1950s, the population expanded rapidly, not through immigration, which had essentially ceased after the British assumed control, but through the high fertility rates of the French natives. Therefore, Canada was a nation created — all its institutions, culture, education, parliamentary government, common and civil law, modern infrastructure — by Anglo and French immigrants and natives. I repeat, when Bissoondath arrived in 1973, Canada was still overwhelmingly European in ethnicity. The claim that Canada was never "a White Christian country" is a historical fabrication intended to justify the current cultural Marxist agenda. Bissoondath says mainstream Canadians should not fear that an "ill-defined Canadian way of life is disappearing", accepting mass immigration is just "part of growing up".7 He implies that before diversity arrived, Canada had no identity other than being racist in excluding minorities; for all his emphasis on assimilation to Canada, he never says anything positive about the history of Canada; it is all about the world he encountered in Toronto and how he felt about his own identity; the Canadians who created the country are portrayed as closed minded, even though most of Canada's cultural heritage was already in place in the 1970s, and many of the contributions made thereafter have been in pop culture and cultural Marxist thinking. He notes that the language used by proponents of multiculturalism consists mostly of "comforting and soothing" words, but his book is suffused with equally insubstantial words about the wonderful cultural complexity and vibrancy of diversity. How does one explain the incredible cultural accomplishments of ethnically homogeneous ancient Greece, Elizabethan England, and16th and 17th century Spain? What truly great artist, philosopher, musician has Canada produced since diversity began in earnest? Bissoondath presumes throughout that multiculturalism on its own nurtures a strong sense of ethnic identity. But multiculturalism is best seen as an official acknowledgement of the growing and planned diversification of Canada and the strong bonds humans have naturally to their ethnic heritage. In this light, the question that needs addressing is how far should Canada go in promoting mass immigration; is there a point at which the actual diversity of races begins to threaten the "Western" cohesion of Canada? There are no known cases in human history of liberal democratic cultures outside Europe. There are no known cases of racially mixed liberal democracies in the world. We are currently in a state of experimentation. Bissoondath chastises the former Reform Party's policy of reducing our immigration intake from 250,000 to 150,000. He wants more diversification. He prefers his city of residence, Quebec City, above all other cities, but feels uncomfortable with the "old, racially minded nationalists" in Quebec. Race is "simply like the shape of one's ears", why should it matter to the native Quebecois if millions upon millions of immigrants keep pouring in, so long as there are no multicultural policies? Well, for one, the PQ party, which is a party that emphasizes cultural, not ethnic nationalism, has been unable to advance its drive for independence due to the "ethnic vote", the mistrust immigrants have of cultural nationalism. Bissoondath categorizes any policy or idea about setting limits to immigration as if it were a call for a racially homogeneous Canada. How many more years of mass immigration does Canada need before it ceases to be homogeneous and can be identified as diverse? Why is he assuming that a Canada that is minority European is bound to be richer culturally than a Canada that is 90 percent European? None of these questions are ever asked in Canada because, when all is said, the cult of immigration from non-European lands is the true religion accepted by all parties and elites without debate and democratic input — unlike Bissoondath's critique of multiculturalism which was the subject of open debate across the nation and did not preclude him from achieving honorary status. I must thank Mr Duchesne and his blog for helping to restore my faith in Canada, a country which sadly seems dedicated to the replacement of a rich and unique European heritage with a consumerist junk culture which praises 'equality' above all else. Shallow, self-absorbed and hedonistic individuals such as Bissoondath are a product of such a society -I'm glad I don't live in Toronto. However, I take issue with the statement that excepting immigrants to assimilate is "a form of cultural supremacism". Were Anglo-Americans and Australians expressing 'cultural supremacism' when they required British and German immigrants to assimilate under their pre-60s immigration policies? Are the Japanese 'culturally supremacist' for expecting immigrants to abide by their standards and customs? Does it even matter if they are? When coupled with a sane immigration policy, cultural assimilation is a healthy survival strategy. I know you mentioned already that current circumstances are different, but I think it's important not to accidentally appear to be against assimilation per se. While I agree that everyone has the right to maintain their ethnic heritage, they do not have a pre-existing right to immigrant to another people's country. It should be a given, in my opinion, that when someone chooses to settle in another nation's territory, they must be willing to commit any sacrifice expected of them. After all, a society can only function to the degree that there is common language and understanding among its members. "When coupled with a sane immigration policy, cultural assimilation is a healthy survival strategy." Not really. Human nature forbids assimilation. Assimilation has a deracinating effect that turns people into "Shallow, self-absorbed and hedonistic individuals." For to have these characteristics, one must perforce be stripped of one's ethnic, racial and cultural heritage. I'd rather break up into ethno-states and have the right to self governance, unfettered by the REAL enemy: the Federal/Provincial governments. It is already happening, as whites self segregate - this is a 'real thorn in the side' for those ignorant social engineers who desperately want to cling on to power. People don't want to assimilate - The fact that you are glad that you "don't live in Toronto" proves my point. I am conceding to the reality that Western countries have masses of immigrants and more keep arriving yearly and the majority Europeans are OK with this, and there are two established responses, one is to promote multiculturalism and the other one is assimilation, and, my response, is that, given this reality, assimilation makes no sense; it would if we were dealing with a few thousand of non-European immigrants, but we are dealing with millions. Assimilation says that all humans are the same and can belong to a common culture, so it destroys the uniqueness of European culture and ethnicity, calling for racial fusion and cultural fusion at the level of every day life, while adhering to a political order that is liberal-democratic, believed to be the best for humanity. Multiculturalism at least recognizes ethnic and cultural differences; the problem is that it only recognizes the group rights of presumed victims or minorities, but if we can use the ideas of multiculturalism -- which as I have tried to show, rely on ethno nationalistic thinkers from Europe, Herder --- it would at least give us a foot inside our establishment to advance the group interests of the majority Europeans, from which point we could then work to awaken the ethnic interests of Europeans, creating a political dynamic that would eventually undermine the entire system, as I suggested in the article "Multiculturalism is better than Assimilation"
Requiring ethnic Europeans to assimilate to a wider or more inclusive European culture such as Canada, Australia and the US is not a form of cultural supremacism but simply a matter of creating a more cohesive nation state, and this type of assimilation worked. Requiring small numbers of non-Europeans to assimilate is also not a form of supremacism for the reasons you point out. But the assimilation that is being promoted now is very different, and is intended to create a radically new ethnic reality. Bissoondath is a very strong supporter of mass immigration and racial/cultural mixing. He is not calling for assimilation to a Canada that is inclusive of many European ethnicities, but for a new Canada in which group ethnic identities are abolished. This is a form of cultural supremacism in that it is lauded as a better cultural and ethnic arrangement that overcomes the ethnic divisions and parochialism of the past. Both European ethnic and minority ethnic identities are seen as inferior to the new order he endorses. The idea that America and Canada are "universal" nations for a new liberated humanity is a form of cultural supremacism. One can argue that America was already moving in this direction, and it was only a matter of taking a few more steps before they introduced the immigration act of 1965. Thank Mr Duchesne for taking the time to reply to my comment. I think I've misunderstood on this matter. I am certainly not advocating the type of assimilation promoted by Bissoondath, which I agree amounts to a form of neoliberal cultural supremacism. I just wanted to make clear that an ethnonationalist need not be against assimilation per se, as some level of immigration and assimilation between compatible groups is nothing new or unnatural. My issue is that I often hear the charge of 'cultural supremacism' leveled at ordinary Whites for expecting immigrants to have basic competence in their country's language or customs, which I find absurd, since such things are obviously necessary for a functioning society. Like you, I support the creation of nation states for different peoples, but that does not mean, in my opinion, that no immigration can ever take place. So long as immigrants are assimilable, come in the right numbers, and steps are made to integrate them into society as part of the social contract. I believe you also misunderstood what I was trying to say on the Charles Taylor article. I was not replying to you but to the anonymous commenter who said: "The parent culture that makes immigration desirable to immigrants must be maintained or else the very refuge the immigrants sought in the first place will no longer exist for them." "The idea that America and Canada are "universal" nations for a new liberated humanity is a form of cultural supremacism." Very well said, Professor. The only reason why cultural marxists call it a form of 'cultural supremacy,' is because THEY want to be the supremacists, i.e., the Regime that now rules us. I think you were correctly asking for clarification, and readers will benefit from our exchange. 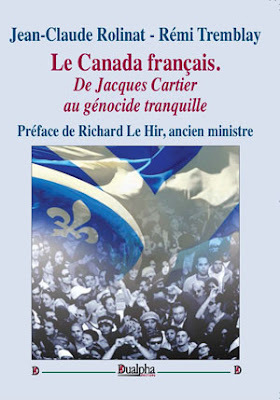 I was hesitant to use the term "cultural supremacism" for the reasons you suggested; it can be misleading if people don't make distinction between assimilation by European ethnics and by relatively small numbers of non-Europeans to a healthy ethno-nationalistic Canadian society, as it was before the 1960s, and assimilation to a civic-universalist nation claiming to represent humanity, the last stage in human evolution, demanding everyone to relinquish their ethnic identity. Bissoondath et al. talk about individual choice in one's identity, but if individuals choose to maintain their ethnic identity, they are called racist; why should European Canadians not have the choice to prefer a Canada that is, say, 90 percent ethnically European? Ricardo, I love reading articles of someone who actually shares my views! Thank you for dedicating yourself to this issue! "The American melting pot model is anachronistic; it made sense when the vast majority of immigrants into the U.S. were from Europe." And this is, in it's truest sense, what multiculturalism really is because Europeans are not only all RACIALLY similar (Nordic, Dinaric, Alpine, Mediterranean), but they also ave very similar cultural values and conception of the world shaped by their evolution over millennia. When one compares these values with non-whites who have a different view of the world and hence, evolved differently, it is not just multiculturalism, it is, more accurately, mutli-racialism, which, like Yugoslavia, will end in disaster. Yes, in its true meaning multiculturalism was already a reality in all those nations in which different ethnic Europeans coexisted with similar rights. The multiculturalism that was imposed in Canada (and later Australia) was intended to deal with mass immigration from non-European lands, and this is why its theorists spent considerable time addressing the ethnic group rights of minorities. This is why, too, it did not matter that multiculturalism was never officially introduced in the US; the millions of immigrants coming from non-European lands, and the inability of Blacks to assimilate, created multiculturalism in there as well. Thank you for yet another interesting article. I have a question. Is it your view that multiculturalism can truly function in practice even if there is no longer an implicit arbiter group, a culturally grounded central driver, arbitrating between the groups and the differences that shall arise? Reckless though Bissondath's plan may be, he does seem at least to theorize for a new dominant group that will police all the others in the event of disagreements. I am not endorsing multiculturalism as it is currently established, but saying that it is better than assimilation insofar as it recognizes that ethnicity matters; and even though it affords group rights to minorities only -- in the way it is currently established -- it can be used to advance the ethnic rights of the majority European population, including our right to protect our history and identity, which would involve drastic cuts in immigration and an end to the politics of affirmative action for minorities. If I understand you correctly, Bissoondath does believe that the politics of individual rights is enough for everyone to be treated equally regardless of ethnicity. So, one can say that he views liberal rights as a dominant arbiter of everyone, making sure that all ethnicities play fair. This is the liberal right view (mind you Bissoondath is an economic leftist in his support for government intervention in the economy), which attracts many critics of multiculturalism who feel that minorities are getting special treatments. But I think there is more to Western nations than individuals rights; there is also their collective history, norms, ethnic identities, which cannot be protected unless the borders are closed. We need ethnic nationalism, which is not to say that liberal rights will be trampled upon. As it is, the policy of mass immigration cannot be questioned openly without charges of racism, so it violates the rights of Canadians to make choices about what country they would like. I hope it will be reposted for editing. That video is readily available in the web, and there are many other blogs dealing with that issue. I think what we call "political correctness" needs a more formal name; the current tag is vague, and seems deliberately so. Fascists in Europe were not politically correct; the Marxists/Communists started political correctness. It's commonly called Cultural Marxism, or CultMarx for short. Orwell was a prophet. Big Brother wasn't the government, it was the populace, armed with personal cameras and a cash reward for reporting thoughtcrime.